San Diego divorce attorneys know that the failure to pay child support can result in substantial monetary penalties or jail time, but sometimes these penalties merely exacerbate the problem. Take, for example, Desmond Hatchett, a 33-year-old man in Knoxville, Tennessee. Mr. Hatchett has asked a Tennessee court for assistance paying child support he owes, which under normal circumstances would likely garner little or no attention. However, according to a local news station, his child support obligations are to his thirty children among eleven mothers. In a case like Hatchett’s, neither monetary penalties nor jail time will solve the underlying problem of the need to support nearly a dozen families, and two and a half dozen children. No state regulates the number of children a person may have. Indeed, such a law would likely be struck down as violating the U.S. Constitution, as well as many states’ own constitutions. However, cases such as this one suggesting present difficult questions of policy. Those in favor of conservative politics have long argued for the reduction of government social programs, such as welfare and food stamps. Hatchett’s case provides ammunition for the arguments that some individuals take advantage of the government’s willingness to step in and provide support. On the other hand, those favoring more liberal government programs argue that reduction of these services would unfairly and significantly hurt families who have been impoverished by uncontrollable forces, such as disease, natural disasters, or crime. While each argument has merit, commentators on either side of the debate would likely be perplexed at Hatchett’s request for government aid. According to the Los Angeles Times, Hatchett’s children range from toddler-age to fourteen years old. Under the child support order, Hatchett must pay fifty percent of his minimum-wage income towards child support. This leaves one of the mothers receiving only $1.49 in child support. There are no easy answers for Hatchett’s situation, or other similar albeit less extreme situations. Noncustodial parents and custodial parents alike have a duty to support a child. For the noncustodial parent, this support frequently takes the form of child support payments to the custodial parent. In California, the amount of the child support owed is based on the parent’s monthly income and the amount of time spent with the child. The maximum a parent may be required to pay in child support is half of his or her monthly income. Upon request by one of the parents, a court can modify his or her obligation based on changed circumstances on the part of the parent, the child, or both. While courts may consider “extreme financial hardship” in calculating or recalculating child support obligations, these situations are very limited. Hatchett apparently asked the court to modify his obligation, but it is not clear what feasible options are available that would be truly fair to all parties. 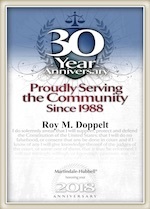 San Diego child support attorney Roy M. Doppelt has over 20 years of experience practicing family law. His practice includes helping individuals with child support issues, assisting with child adoption procedures, and advising people through the divorce process. We are pleased to serve clients in San Diego, Baypark, Carlsbad, Miramar, and throughout Southern California. For a free confidential consultation, contact Doppelt and Forney, APLC online, or call us at (800) ROY IS IT (769-4748).